GALION — The Galion Historical Society has been working on organizing a Veteran Banner project since last November. The project finally came to fruition in May 2018 when members, and former members, of the Galion Community were able to sponsor banners for local veterans. Galion Historical Society Office Manager, Tanesha Pickering, saw the idea for Veteran Banners while on a road trip and brought the idea to the Galion Historical Society Board of Directors, which enthusiastically supported the idea. Galion Mayor Tom O’Leary gave the Galion Historical Society permission to hang the banners on lamp poles along both sides of Harding Way and also wrote a letter of support to go with the Galion Historical Society’s grant request to The Community Foundation for Crawford County for project funding. The foundation funded the purchase of 40 banner brackets. Each supports two banners. Additional brackets were purchased thanks to a generous donation from the Galion American Legion Scarbrough Post 243. The Galion Historical Society worked closely with Craig Alguire, of Photorama, to design the 2-feet by 4-feet banners. Alguire lowed the fee to produce the banners to show his support for the program. The charge is $45 per banner. On Tuesday, the historical society hosted a ceremony to recognize the veterans who were honored in the 2018 banner project. More than 170 veterans, friends, and family members attended the ceremony at Historic Grace Church. The American Legion, under the direction of Ken Green, provided a color guard to bring an authentic military tribute to local veterans, complete with bugle calls. Galion Historical Society board president Marcia Yunker welcomed veterans, family members, and friends. Yunker asked that current service members and veterans stand to be recognized, while thanking them for answering the call to duty and recognizing that some of Galion’s “Hometown Heroes” could not be with us tonight as some made the ultimate sacrifice, some did not make the transition, and some have gone on before us. She asked family members, friends and colleagues of veterans to stand. “Your presence here tonight is a way to say to veterans, we remember. We remember, we honor, we respect, and we recognize,” Yunker said. Former military chaplain, James Murphy, gave the invocation. He asked for blessings for veterans and those in attendance. “Lord, place your hand, especially upon those here tonight, who are shown on banners, their family, their sponsors, their friends. We are, and always will be, grateful,” Murphy continued. Pickering then introduced a tribute video depicting all 123 veterans honored this year. Veterans, sponsors, and friends were asked to stand when their veteran appeared on the screen. The video can be seen on the Galion Historical Society Facebook page and soon can be viewed at www.galionhistory.com. Galion Historical Society board vice-president and veteran, Mike Mateer, read the Veteran’s Creed, consisting of eight veteran qualities and commitments. “I am an American veteran. I proudly served my country. I live the values I learned in the military. I continue to serve my community, my country, and my fellow veterans. I maintain my physical and mental discipline. I continue to lead and improve. I make a difference. I honor and remember my fallen comrades,” he said. Mateer then asked everyone to stand for the playing of “Taps” and remain standing as the “Colors” are retired. In her closing remarks, Yunker said: “Your overwhelming support of this project has been phenomenal. 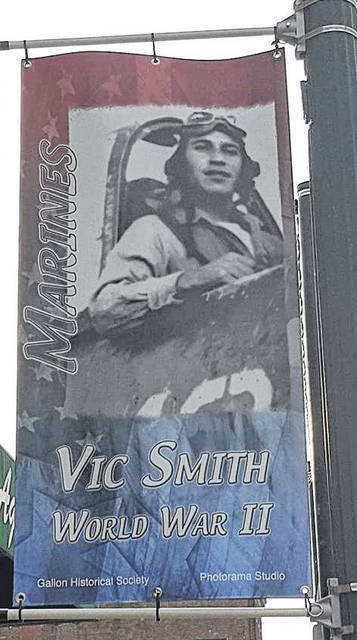 With your help, you have helped the Galion Historical Society to preserve and promote such an important part of our local history.” Yunker also noted that this year’s banners will hang through Veteran’s Day. The Galion Historical Society will store the banners until May of 2019 and they will be hung again next year, along with the 2019 banners. It is hoped that the banners will weather well, with a goal of repeating the process in 2020. 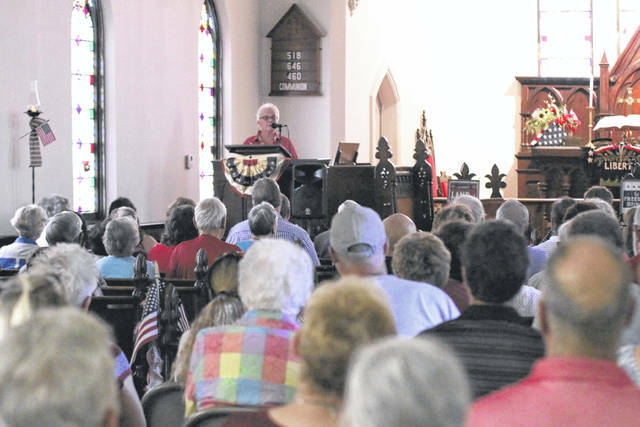 Erin Miller | Galion Inquirer An overflow crowd attended a program Tuesday at Historic Grace Church in Galion to dedicate the veterans banners that are currently on display along both sides of Harding Way in uptown Galion. Galion Historical Society President Marcia Yunker addressed military-themed program and announce plans for more banners to be added in the future. https://www.galioninquirer.com/wp-content/uploads/sites/38/2018/07/web1_IMG_7201.jpgErin Miller | Galion Inquirer An overflow crowd attended a program Tuesday at Historic Grace Church in Galion to dedicate the veterans banners that are currently on display along both sides of Harding Way in uptown Galion. Galion Historical Society President Marcia Yunker addressed military-themed program and announce plans for more banners to be added in the future.